If you want to spend quiet time, you would do better to visit the Museum Gardens, my favorite spot in York. 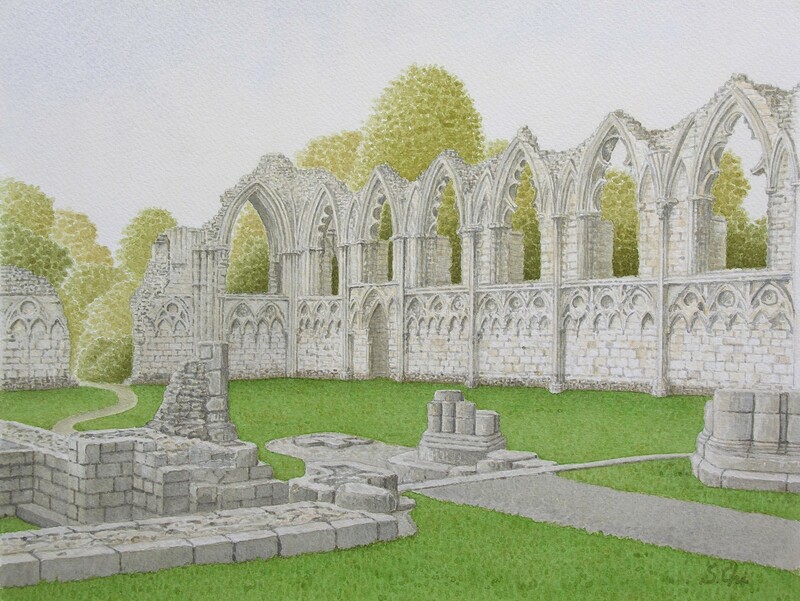 There are the ruins of St Mary's Abbey, which was the most important Benedictine monasteries in the north, and many other remains and historic buildings are also there. Going out the old town of York from Bootham Bar and walking along Bootham then Marygate, you will find the entrance to the Museum Gardens. Passing through the Norman gatehouse of St Mary's Abbey, you can see the ruins of the abbey lying on the green on the left. The abbey was founded in 1088 and completed in the 14th century. In 1539 the abbey was dissolved and ruined. Though only a small part of the church remains now, you can see the elegant arches of window frames on the walls. The arches were built in the Decorated style, Gothic from the late 13th century to the first half of the 14th century. On the place, which used to be a part of the ruins, stands Yorkshire Museum. Seeing the head of the statue of Constantine the Great, who was proclaimed Emperor in 306, the statue of Mars and Roman coins there, I realised that the Britain was a part of the Roman Empire. York is full of such reminders. In the south of the Minster, a Roman pillar about 30ft high dating back to the 4th century stands, which was discovered under the south transept in 1967. On the right, that is, south-east of the museum, there are the Roman Walls and Multangular Tower which was a fortress at the west corner of the walls. It is interesting that there are the obvious diffrences in building methods between the lower part of them and the upper part. The lower part, constructed in about 300 of the Roman ages, was built a little roughly. On the other hand, the upper part, made in the 13th century, was built with the larger stones with fine medieval masonry. The several Roman coffins, which were unearthed in York, are placed inside of Multangular Tower. Behind Yorkshire Museum, there is King's Manor, the former residence of the abbot of St Mary's Abbey. Henry VIII established the Council of the North(c1540-1641) here after the Dissolutions of the Monasteries, and stayed there with Katherine Howard in 1541. James VI of Scotland also stayed there on the way to London for the coronation as James I of England in 1603. During the Civil War, Charles I set his temporary court here in 1642. At the north corner of the walls which surround the ruins, there stands St Mary's Hamlet, a small tower. During the Siege of York on the 16th of June in 1644, the Parliament Army exploded a mine under the tower and tried to storm King's Manor, the stronghold to defend the city. Their operations ended in failure because of the determined resistance of the Royalists. Museum Gardens is a place where time passes tranquilly. It reminded me of many historic events.